2015 will be Archaeology Live’s 15th season of excavation in York. Since 2001, we’ve worked on some of the most exciting sites that the city has to offer and made some truly amazing discoveries. Over the years, thousands of trainees from all over the world have joined us on site to investigate countless tons of deeply stratified archaeological deposits. Many of these trainees are now professional archaeologists and many others return to dig with us year after year. From 2001 onwards each season of Archaeology Live! has been completely funded by the people who take part in the dig. All of the amazing finds we have unearthed over the years simply wouldn’t have been found if it wasn’t for the support of our small army of dedicated and passionate trainees. As we prepare for our 2015 season, now seems like a good time to take our second look at the history of Archaeology Live! 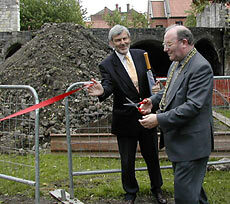 Richard Hall and the Lord Mayor open the excavation. The 2002 season had a lot to live up to! Archaeology Live’s 2001 debut had been a hit, with finds and features exceeding all expectations, even in such a richly historic setting. Archaeology Live! was to continue in the spectacularly located space occupying the western angle of the former Roman legionary fortress. In close proximity was the the ‘Multangular Tower’ which still stands to a height of over 4m; and the Anglian Tower, a mysterious addition to the fortress defences which is thought to date to the late Roman or Anglian periods. 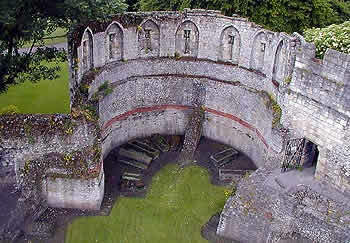 Also within the bounds of the site were remains of the hospital of St Leonard, established in the 11th century by William II. St. Leonard’s flourished until the Reformation as the largest hospital in England in terms of inmates and staff. Part of the hospital complex was rebuilt in the 13th century, and a gate, chapel and infirmary with vaulted undercroft survive up to first floor level on the excavation site. Trench 1 was positioned to locate interval tower SW6 – that is, the sixth of six stone-built interval towers along the south-west side of the later Roman fortress defences. Trench 3 was designed to examine the whole range of activity from the establishment of the Roman fortress through to a World War 2 air-raid shelter. Elevated view of site from roof of adjacent library. A short blog post isn’t sufficient to talk in great detail about the findings of Archaeology Live! 2002 but here are some of the highlights. Trench 1 provided a great window in to the site’s Roman archaeology, eventually exposing the wall of interval tower 6 and recovering many finds from the rampart identified in the north western part of the trench. Before these were reached, however, a closer look was taken at the substantial medieval drain identified in the first season and numerous pre – Norman conquest features. In trench 3, considerable progress was made in the 2002 season in understanding what proved to be a highly complex archaeological sequence. The hospital’s construction horizon, a hearth, levelling deposits, floor surfaces and numerous dumps were all painstakingly recorded. The Roman finds that were unearthed each week came from the fortress rampart which had been partly dismantled and spread out in order to provide a flat surface upon which to build the hospital. An intervallum road and Roman buildings may lie alongside the Roman rampart, but because of the complexity of the work this year, the excavation did not get past the medieval layers. The 2002 season of Archaeology Live! at St Leonard’s was another great hit in terms of public engagement. Over 13, 400 people visited the excavation, in addition to the dozens who actively participated. Additional sessions including a childrens activity day, school class ‘spoil heap challenges’ and a visit from the Comitatus (a 20 man Roman re-enactment group) on National Archaeology Day helped to enrich an already fantastic season of Archaeology Live! A typical busy day of visitors looking down in to trench 1…. The 2002 excavations were a huge success involving thousands of people and dealing with complex and fascinating archaeology. At Archaeology Live! we believe that with the right training, no archaeology is too complex or difficult for members of the public to work on, with or without prior experience. The team of staff, placements and trainees made a great effort on what would prove to be a number of seasons at St. Leonards. We’ll be posting about the findings of the further seasons in the coming weeks. As we enter our fifteenth year of trainee funded archaeology in York, we look forward to many more exciting discoveries to come! Our Archaeology Live! tour guides for the 2002 season including YATs own Dr. Jayne Rimmer (second left) who hasn’t aged a bit! Toby has aged a bit… but what about the computer he’s working on. That’s prehistoric isn’t it?! Haha! It is certainly something of a dinosaur! Hi Paul, I’ll pass on your best wishes! Good to hear you remember your time so fondly. Haha! By the paucity of pictures of Kurt from that year, I’m presuming that he spent most of his time taking the photos as opposed to starring in them!